Crop tops are a bit of a Marmite trend: you either love or you hate. Admittedly, at its most recent peak in popularity last year there was something a little 'tween' about the look and it mostly came in stretchy T-shirt fabrics and emblazoned with cutesy slogans. Yes, they are back for 2018, but rest assured that the crop top has traversed through its angst-ridden teens and blossomed into a thoroughly chic grown-up. So what's in store for the crop top 2.0? First and foremost, when it comes to styling the trend, skinny jeans are out and straight leg styles are in. High-waisted or not, indigo washes or light, frayed hems or neatly turned-up, the details are up to you. When it comes to the top itself, there's a plethora of styles available: from long-sleeved blouses and off-the-shoulder numbers to gingham-printed button-ups and crochet knits. The options are almost endless. We particularly love the crop tops with balloon sleeves (see the Ellery blouse in our edit), which feels so elegant and will look fabulous with a pair of wide leg white jeans and statement gold hoops. She Made Me's crochet crop is also a winner and will be a godsend on your next beach holiday. Scroll down for more style inspiration to wear crop tops and jeans together again. Style Notes: Ellie from Slip into Style styles her puffed-sleeve crop top with high waist jeans and a Simon Miller bucket bag. 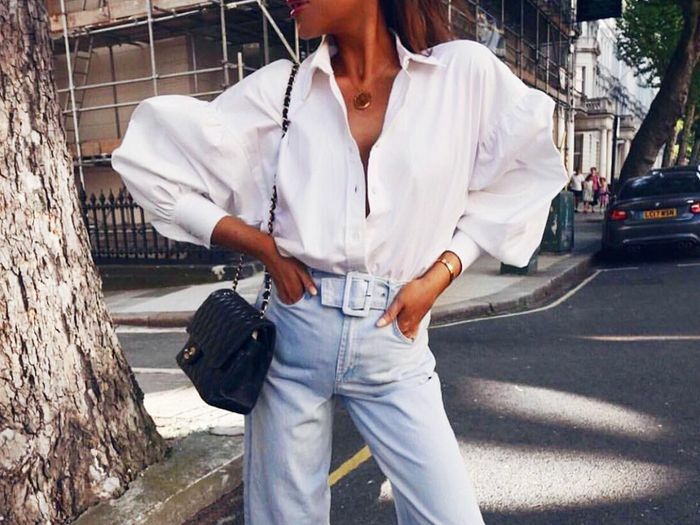 Style Notes: Megan Ellaby shows us how to effortlessly rock white jeans in this summery look, pairing wide leg Topshop jeans with a ruffled yellow crop top. Style Notes: How cool does Courtney Trop look in Orseund Iris' black crop top? White jeans make another appearance, but this time highlighted by oversized turn ups. Style Notes: Style maven Hannah Anderson proves that you can work the trend without exposing your midriff. Her cropped white shirt offers a twist on a wardrobe classic and looks great with dark denim. Style Notes: Now this a look to remember for your next summer holiday. Camille Charriere's Mango blouse is rendered in this season's hottest hue and will carry you from beach to bar with ease.